Jacksonville Jaguars quarterback Blake Bortles appeared to be on the verge of superstardom before the 2016 season, but it’s been all downhill ever since. A kid who threw 35 touchdowns in 2015, Bortles entered last offseason with some extra fire to get even better. He worked with renowned quarterback coach Tom House during the offseason and talked many times about how he needed to improve his mechanics. 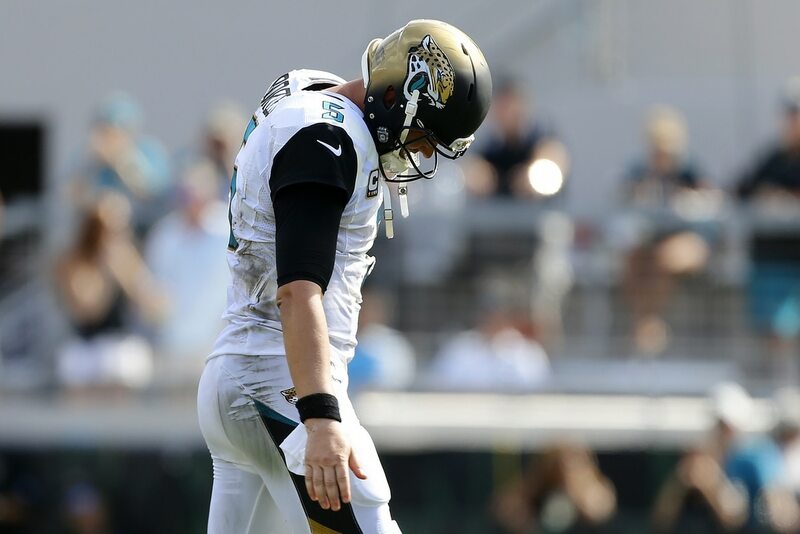 Instead of fixing his mechanics, Bortles somehow got much, much worse. Just check out this absolutely lazy pass Bortles made on a simple out route. It was returned for six points, because the cornerback was able to read Bortles like a book. Once again, this past offseason, Bortles dedicated himself to fixing his mechanics. From his feet to his eyes, Bortles needed help. He knew this. We all knew this. And he went to work to fix his ailing game. Unfortunately, Bortles’ game is still in the pits. He’s struggled during training camp, and has done the exact opposite of shine in two preseason outings. On Thursday against the Tampa Bay Buccaneers, Bortles looked like a green rookie who was getting his first taste of the speed that comes from live action in the NFL. He was awful. His final line doesn’t look terrible by itself — 8-of-13 for 65 yards with no touchdowns or interceptions — but stats are deceiving, especially when it concerns Bortles. At one point, he had Allen Robinson streaking wide open down the right sideline. Bortles had time in the pocket. No pressure at all. He even had time to pat the ball and leisurely toss that ball. It should have been a touchdown. Instead, we saw this. Robinson got open multiple times, and Bortles kept missing him. High, low. He just couldn’t dial it in. And it’s because his mechanics are just atrocious. A kid with all the natural ability in the world to make it happen, Bortles is somehow getting worse right in front of our eyes. He should be really coming into his own as a fourth-year starter. Instead, he’s shrinking as the pressure around him gets more intense. The Jaguars got whipped on both sides of the ball Thursday night. Jameis Winston and the Bucs were able to do whatever they wanted most of the first half. But given the amount of talent Jacksonville possesses on both sides of the ball, we don’t expect this to be a trend. This is a team that has the players to reach the playoffs. Assuming Leonard Fournette can stay healthy, they’ll have unbelievable skill at every position on offense. There’s only one problem. Bortles isn’t the guy to lead this group. And quite honestly, neither is Chad Henne in the long term. But at this point, Henne needs to get a real crack leading the first-team offense the next couple of preseason games. Jacksonville should seriously consider kicking the tires on another quarterback who would, at the very least, provide some legitimate competition for Bortles. That quarterback has been to the Super Bowl and is very careful with the football. He’s also a dual threat who would mesh well with the powerful Fournette in a run-first offense. We’ve highlighted who that guy is in the past. He’d be the perfect fit for a team that has playoff aspirations but is lacking a leader on offense. But it’s highly unlikely Tom Coughlin would call him in for a visit, let alone sign him to a contract. So, Jags fans. Looks like you’re stuck with a broken first-round bust in Bortles, or that you’re going to ride the Henne train throughout the 2017 season. Best of luck to you as you continue to deal with constant football sadness.